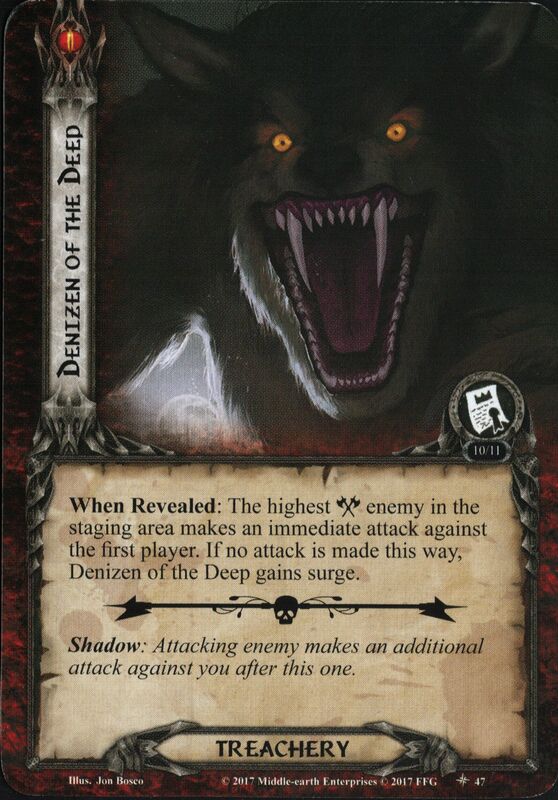 When Revealed: Durin's Bane makes an immediate attack against the first player (deal and resolve a shadow card). Shadow: If attacking enemy is Durin's Bane, it gets +3 Attack. When Revealed: The enemy in the staging area with the highest Attack engages the first player and makes an immediate attack against Nalir. If there are no enemies in the staging area, Get That Dwarf! gains surge. Shadow: If this attack is undefended, deal 2 damage to Nalir. When Revealed: If the total Willpower of character committed to the quest is greater than the total Threat in the staging area, each enemy in the staging area makes an immediate attack against the first player. If no attach is made this way, search the encounter deck and discard pile for an Orc War Party and add it to the staging area. Shuffle the encounter deck. This effect cannot be canceled. When Revealed: Place 1 resource on each Raider enemy in play. Each engaged non-Ship enemy makes an immediate attack. If there are no engaged non-Ship enemies, Battle-Hardened gains surge. Shadow: If the attacking enemy is a Raider, place 2 resources on it. Surge. Grapple ( highest printed quest points ). Forced: After Crushing Arm is detached from a location, it makes an immediate attack against the first player. Shadow: Attacking enemy gets +3 Attack if the players control the Gate Key. When Revealed: If you are off-course (Cloudy, Rainy, or Stormy), the engaged Ship enemy with the highest Attack makes an immediate attack. Until the end of the phase, add 1 to the total Threat in the staging area for each damage dealt by this attack. If no attack is made as a result of this effect, Ramming Speed! gains doomed 2. Shadow: Attacking enemy gets +1 Attack (+2 Attack instead if the temperature is 40 or higher). Immune to player card effects. Cannot take more tha 3 damage each round. 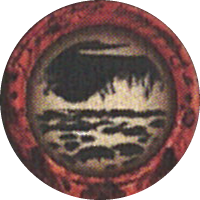 Forced: At the end of the round, the engaged player must choose: either return Wild Mûmak to the staging area, or it makes an immediate attack. 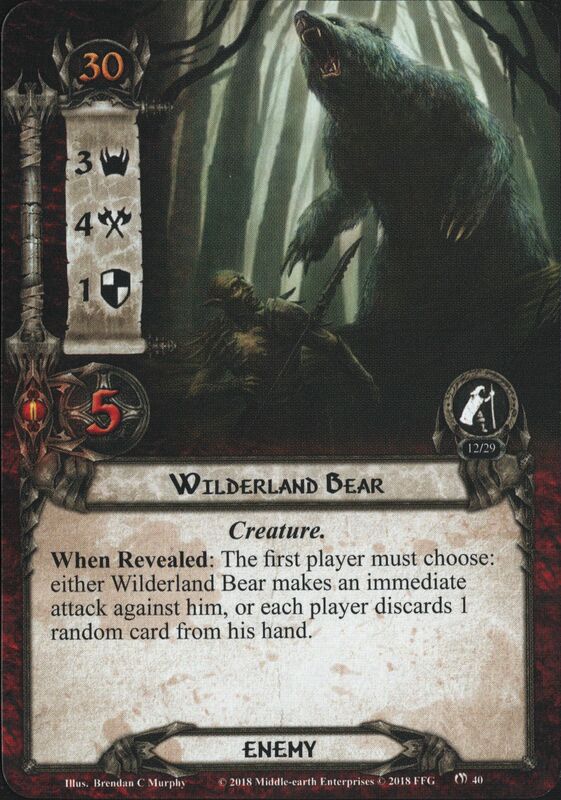 When Revealed: The first player must choose: either Wilderland Bear makes an immediate attack against him, or each player discards 1 random card from his hand. 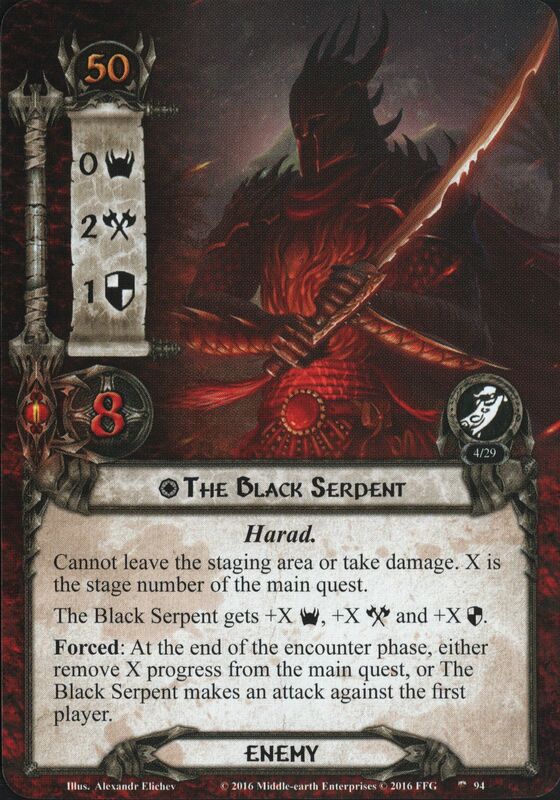 Shadow cards dealt to Dagnir are immune to player card effects and their effects cannot be canceled. 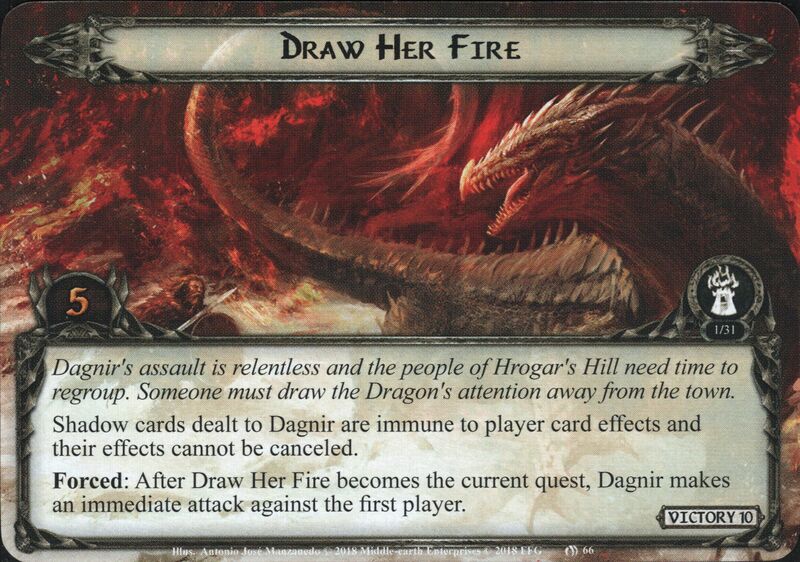 Forced: After Draw Her Fire becomes the current quest, Dagnir makes an immediate attack against the first player. 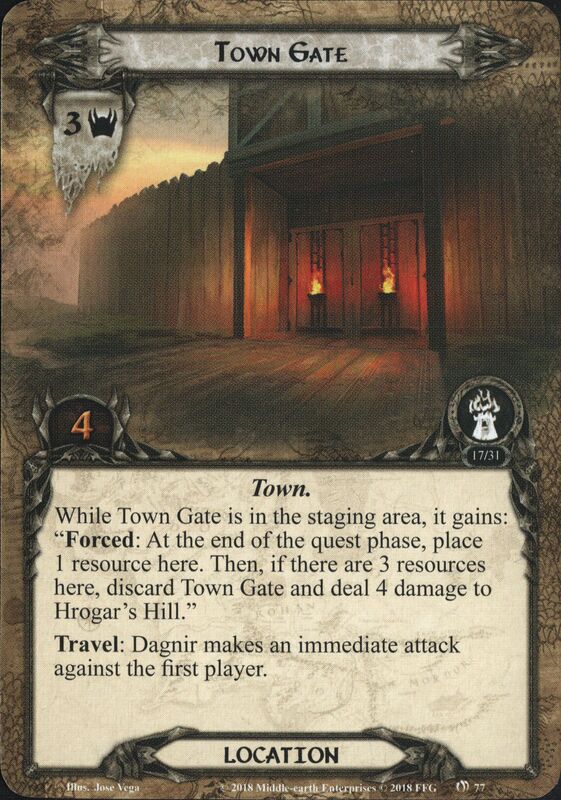 While Town Gate is in the staging area, it gains: "Forced: At the end of the quest phase, place 1 resource here. Then, if there are 3 resources here, discard Town Gate and deal 4 damage to Hrogar's Hill." Travel: Dagnir makes an immediate attack against the first player. 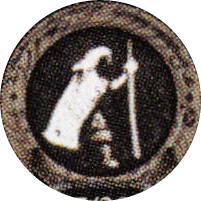 When Revealed: Dagnir makes an immediate attack against the first player. Undefended damage from this attack must be dealt to Hrogar's Hill. Immune to player card effects. The players cannot travel to The Cursed Tomb unless they control 3 Loot objectives. 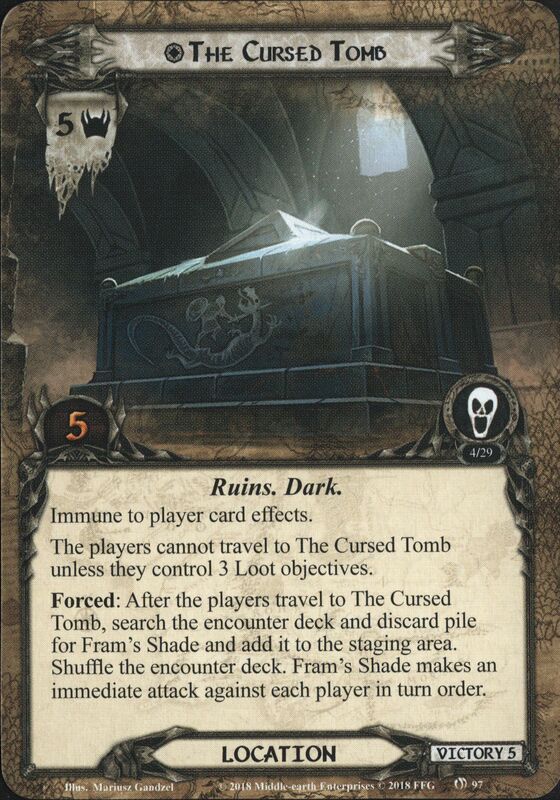 Forced: After the player travel to The Cursed Tomb, search the encounter deck and discard pile for Fram's Shade and add it to the staging area. Shuffle the encounter deck. Fram's Shade makes an immediate attack against each player in turn order. Forced: When Dagnir's Hoard is explored, Dagnir returns to the staging area and makes an immediate attack against each player in turn order. 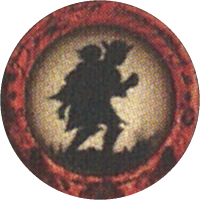 Response: After Dagnir's Hoard is explored, each player may search his deck for an Item attachment, add it to his hand, and shuffle his deck. Forced: When Deep-dweller engages you, it makes an immediate attack. Forced: After Deep-dweller take any amount of damage (and survives), return it to the staging area. When Revealed: Dagnir makes an immediate attack against each engaged player. If no attacks were made this way, Dagnir gets -30 engagement cost until the end of the round. When Revealed: Gollum makes an immediate attack. If no attach was made this way, discard all tokens from Sméagol and flip him to Gollum. Shadow: Raise your threat by 2 (by 4 instead if Gollum is engaged with you). Shuffle Stinker back into the encounter deck. When Revealed: Uruk from Mordor makes an immediate attack against the first player. Shadow: Attacking enemy gets +1 Attack. If this attack destroys a character, attacking enemy makes an additional attack. 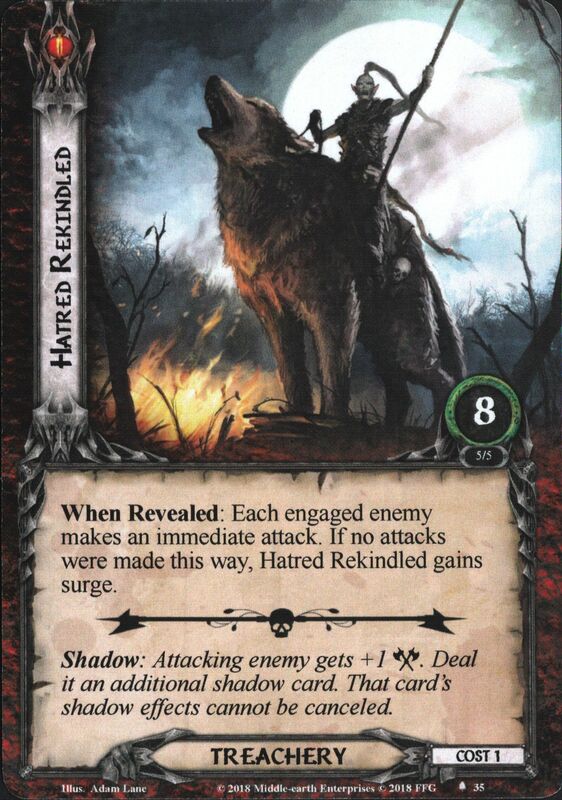 When Revealed: Either choose a player to reveal an additional encounter card, or Uruk-hai Hunter makes an immediate attack against you. When Revealed: The enemy in the staging area with the highest Attack makes an immediate attack against you. If no attack is made this way, Reckless Hate gains surge. When Revealed: Either attach a set aside Overcome by Fear to your threat dial, or Ghosts of Men makes an immediate attack against you. Forced: When Shadow Host engages you, either attach a set aside Overcome by Fear to your threat dial, or it makes an immediate attack. Immune to player card effects. X is the number of resources on Grond. 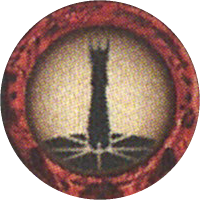 Forced: At the beginning of the quest phase, place 1 resource on Grond. 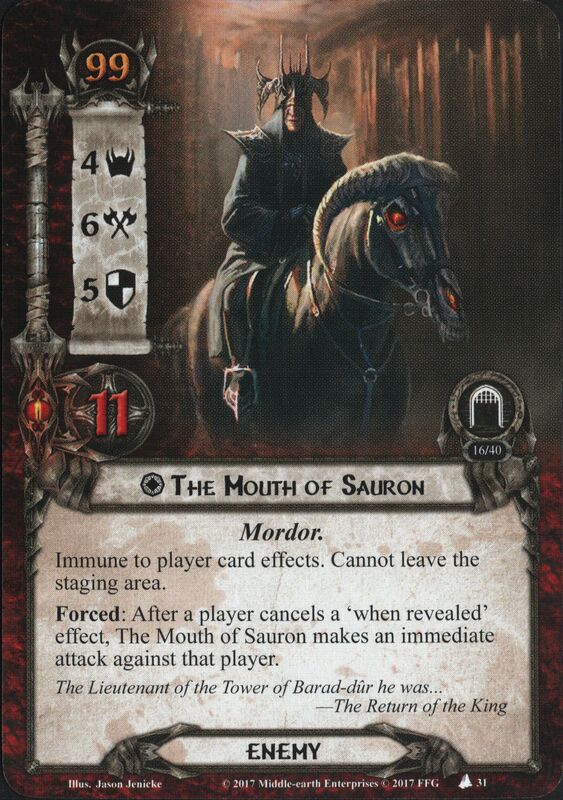 Then, deal X damage to Minas Tirith. Travel: The Witch-king makes an immediate attack against each player, in turn order. Cannot have attachments. 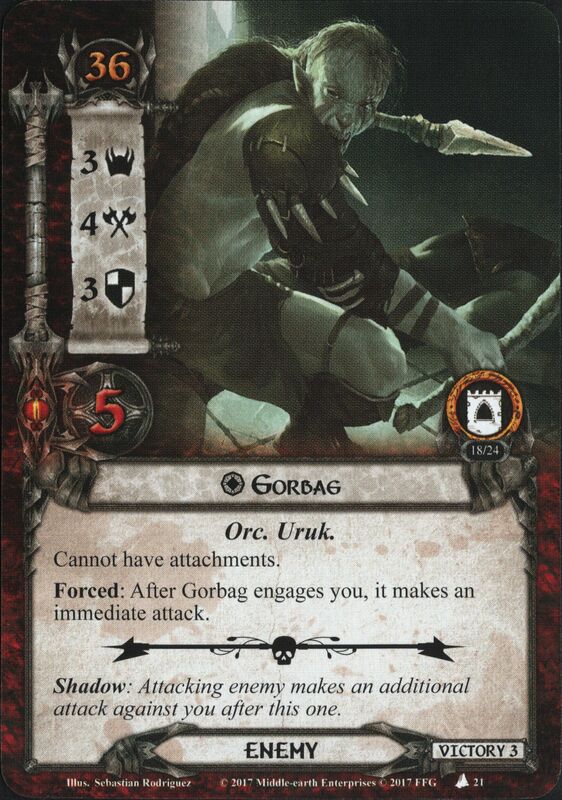 Forced: After Gorbag engages you, it makes an immediate attack. Immune to player card effects. Cannot leave the staging area. 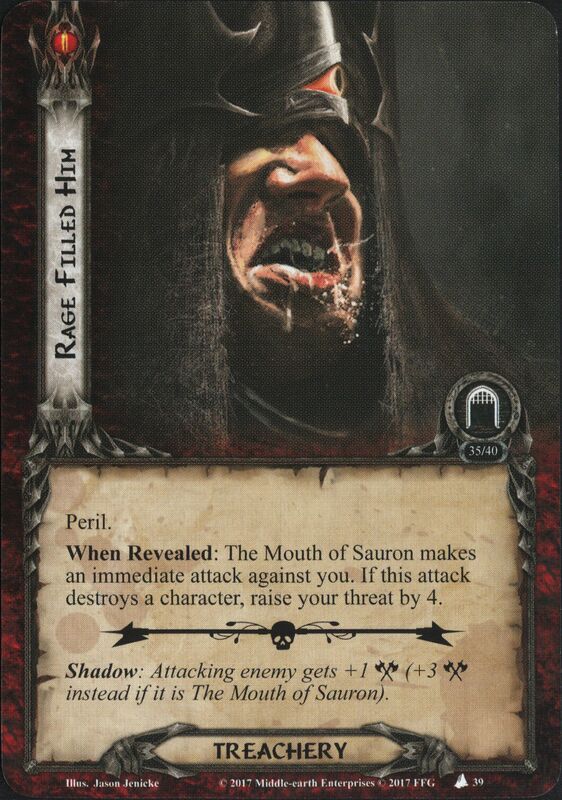 Forced: After a player cancels a 'when revealed' effect, The Mouth of Sauron makes an immediate attack against that player. Shadow: Attacking enemy gets +1 Attack for each ally you control. 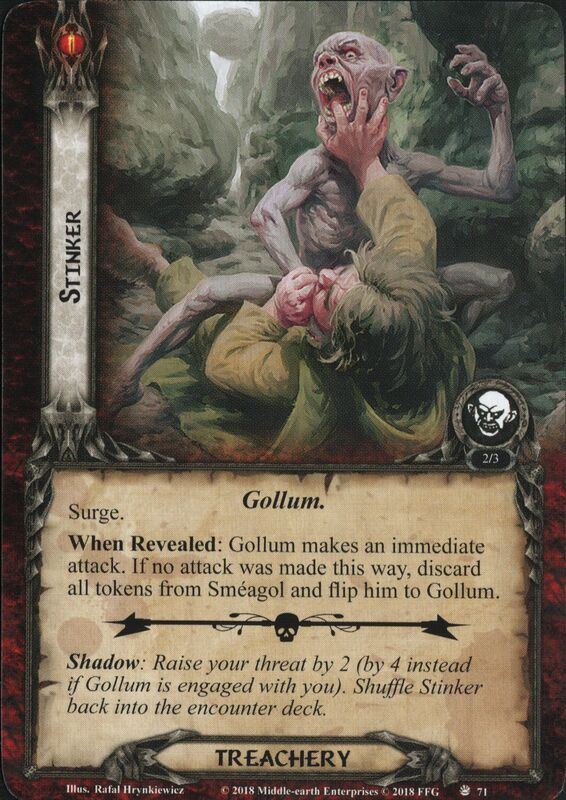 Shadow: If attacking enemy is Gollum, he makes an additional attack after this one. Immune to player card effects. 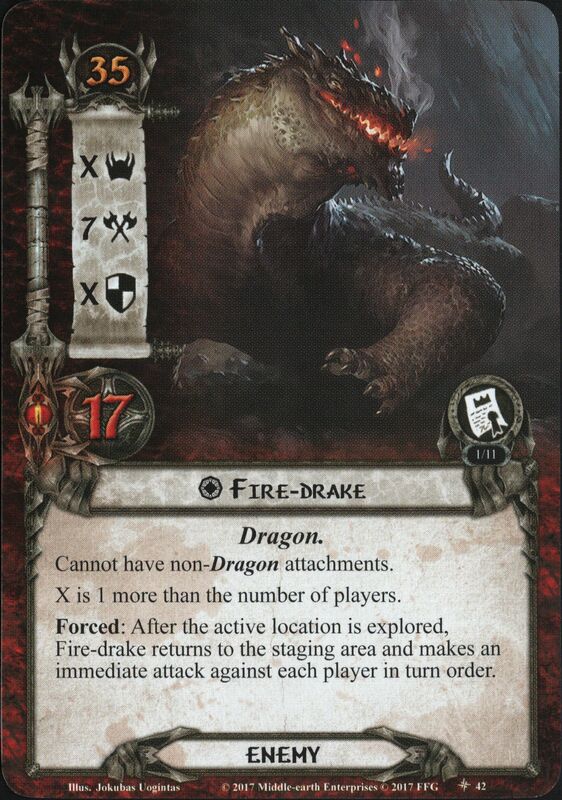 When Revealed: Smaug the Mighty makes an immediate attack against each player (deal and resolve a shodow card for each attack). While Long Trailer is in the staging area it gains: "Forced: After the active location leaves play as an explored location, Long Trailer makes an immediate attack against the first player." When Revealed: Each Wight enemy engaged with a player makes an immediate attack. If no attacks were made this way, I'm Waiting for You! gains surge. Shadow: Attacking enemy gets +1 Attack (+3 Attack instead if the defending character is an ally). 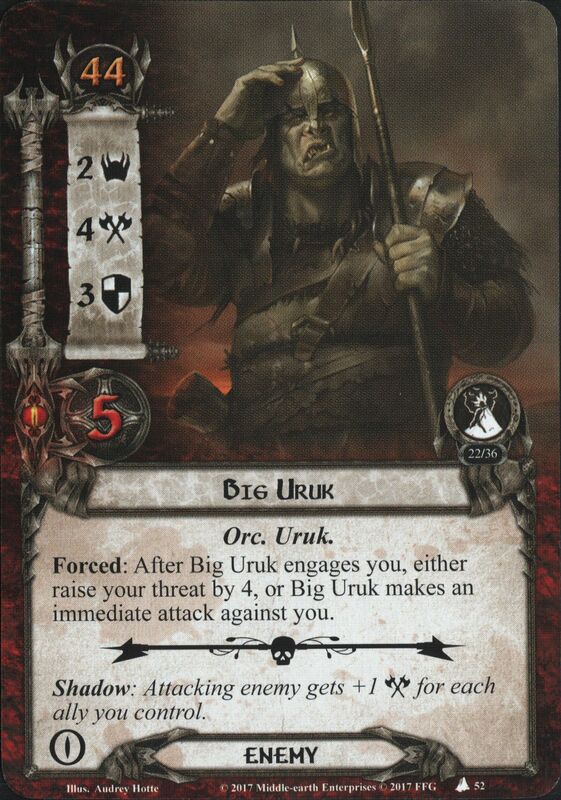 When Revealed: Orc of Ered Luin makes an immediate attack against each player that controls at least 1 Loot objective (in turn order). 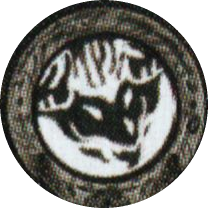 Shadow: After this attack, attacking enemy engages the next player, then makes an immediate attack. 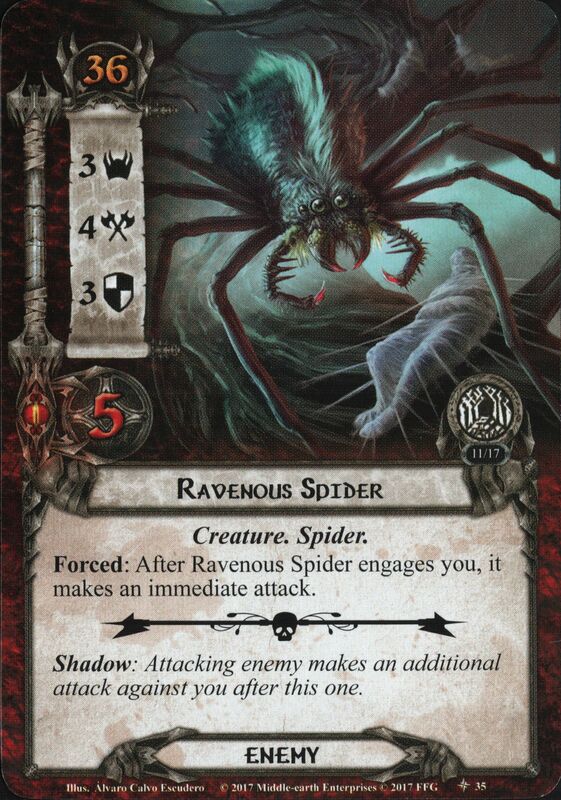 When Revealed: If Naurlhûg is in play, it makes an immediate attack against the first player. If Naurlhûg is not in play, place 1 resource on Stalking the Ruins. Then, if there are at least 3 resources on Stalking the Ruins, add Naurlhûg to the staging area. Immune to player card effects. While Combe Storehouse is in the victory display, each Suspect gains: "Forced: After this enemy engages a player, it makes an immediate attack." Travel: Search the encounter deck and discard pile for a Lawless Ruffian and add it to the staging area. Shuffle the encounter deck. When Revealed: Either raise each player's threat by 2 or Greenway Footpad makes an immediate attack against the first player. Shadow: Attacking enemy gets +1 Attack (+2 Attack instead if your threat is 35 or higher). When Revealed: The enemy in the staging area with the highest engagement cost makes an immediate attack against the first player. When Revealed: The highest Attack enemy in the staging area makes an immediate attack against the first player. If no attack is made this way, Pursued by Shadow gains surge. Shadow: If attacking enemy is uniquie, it makes an additional attack against you after this one. When Revealed: Each engaged enemy makes an immediate attack. If no attacks were made this way, Hatred Rekindled gains surge. Shadow: Attacking enemy gets +1 Attack. Deal it an additional shadow card. That card's shadow effects cannot be canceled. 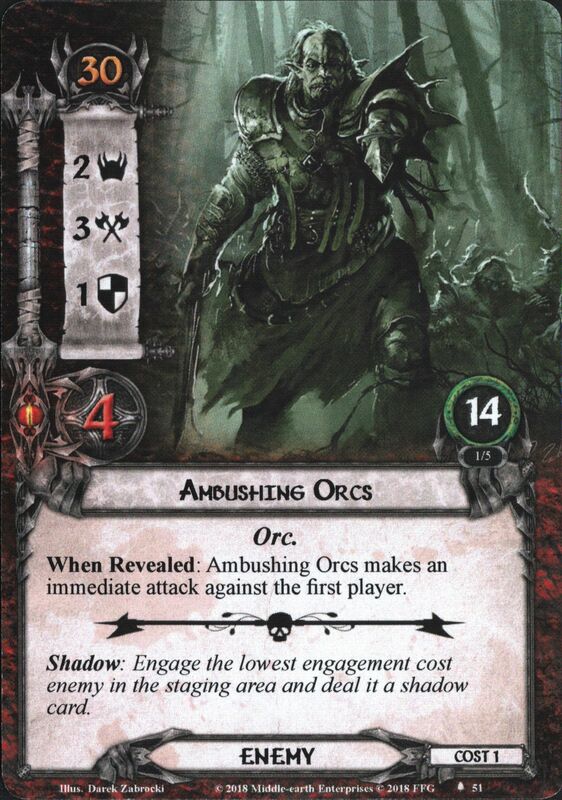 When Revealed: Ambushing Orcs makes an immediate attack against the first player. Shadow: Engaged the lowest engagement cost enemy in the staging area and deal it a shadow card. 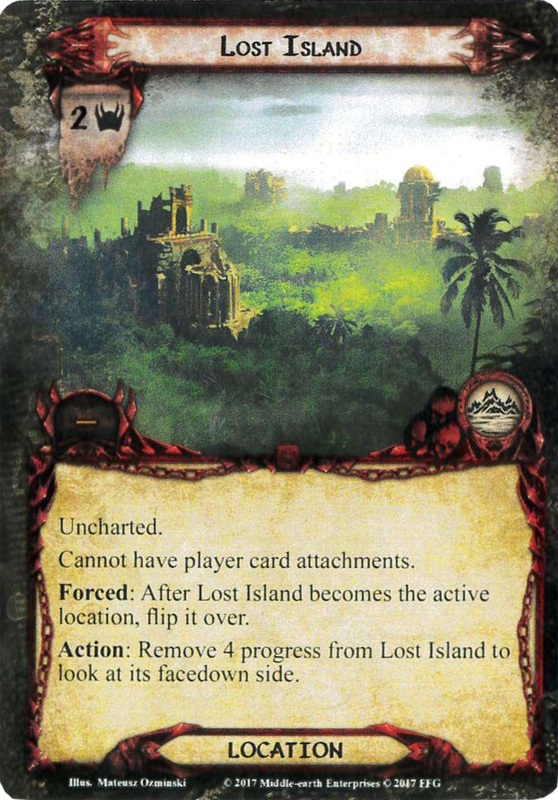 Forced: After Marsh-wight engages a player, that player makes an escape test, dealing 3 cards from the encounter deck. If this test is failed, place 2 resources on Gollum and Marsh-wigth makes an immediate attack. 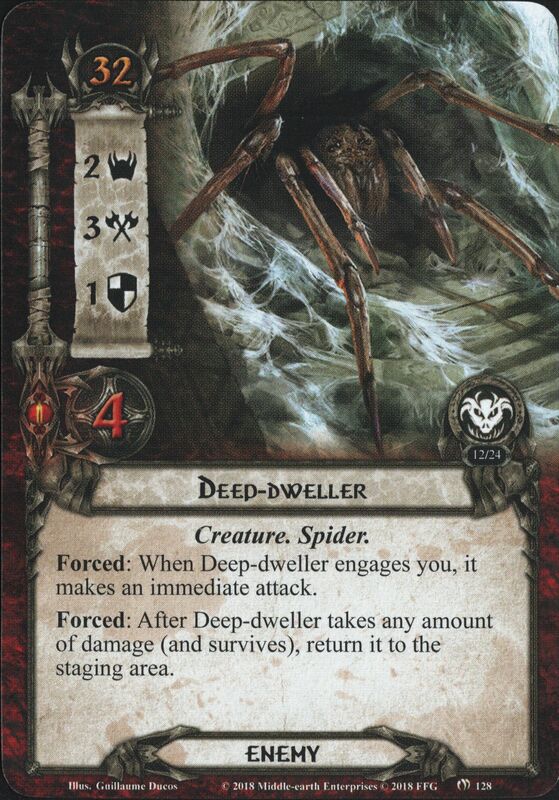 Forced: When Writing Tentacle engages a player, discard the top card of the encounter deck. If that card has a shadow effect or is a Tentacle enemy, Writhing Tentacle makes an immediate attack, then attaches to the defending character as a Tentacle attachment with the text: "Attached character cannot commit to the quest." When Revealed: Murderous Turncoat makes an immediate attack against the first player. Forced: At the end of the combat phase, place Murderous Turncoat facedown underneath the active location if you are not at stage 3. 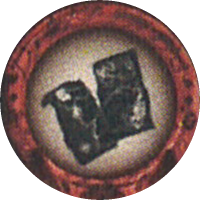 When Revealed: Either discard 1 villager token from Rescued Villagers, or Orc Raiders makes an immediate attack against the first player. 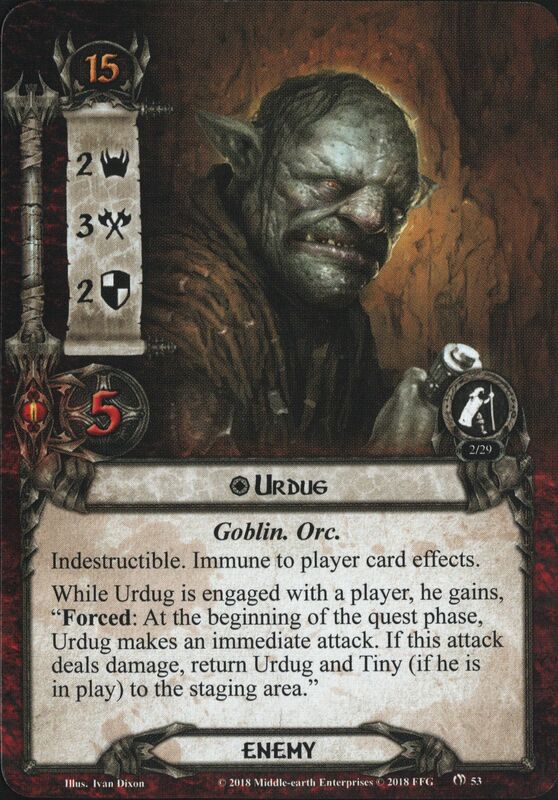 Forced: After Orc Trickster is turned faceup as a hidden card, it makes an immediate attack against the engaged player. Forced: When Orc Trickster would be damaged, a random player takes it facedown as a hidden card in his play area instead. Dunland Assassin cannot be optionally engaged by a player with 3 or more cards in his hand. 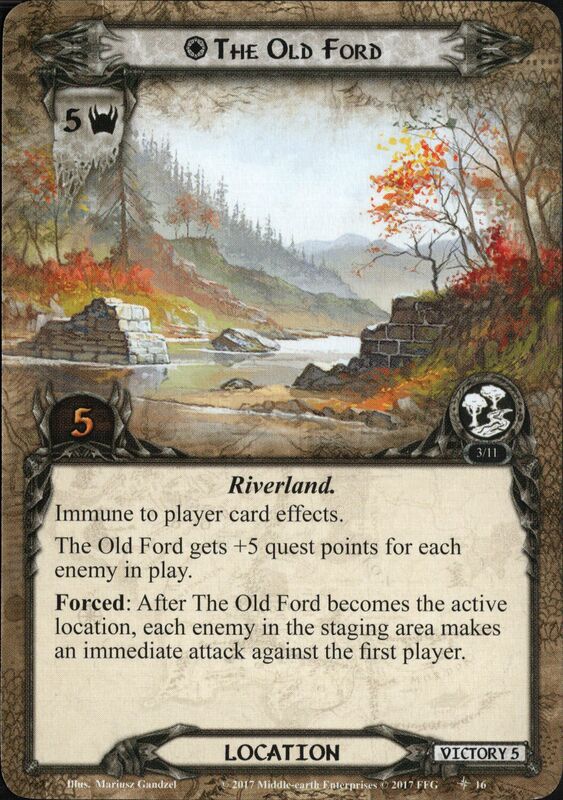 While Dunland Assassin is in the staging area, it gains: "Forced: After the first player draws any number of cards, Dunland Assassin makes an immediate attack against him." When Revealed: Each engaged enemy makes an immediate attack. 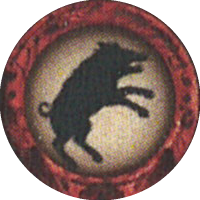 If no attacks are made this way, Boar Clan Assault gains surge. 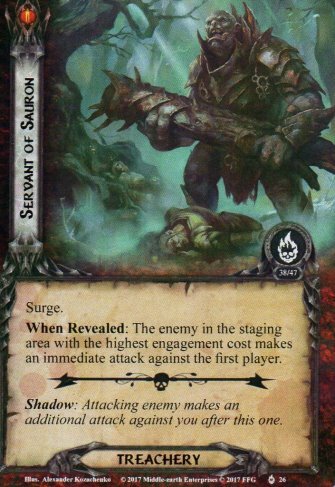 When Revealed: Either reduce each player's threat elimination level by 2, or Orc Seeker engages the first player and makes an immediate attack. Shadow: Reduce each player's threat elimination level by 2 (5 instead if undefended). Forced: After a character the engaged player controls is healed, Angmar Raider makes an immediate attack. While Giant Beetle is engaged with a player, it gains: "As an additional cost to travel to a safe location, Giant Beetle makes an immediate attack against the engaged player." Damaged characters cannot be declared as attackers or defenders against Giant Beetle. Forced: When the engaged player exhausts a Ship objective. Brash Corsair makes an immediate attack. Each Undead enemy gains "immune to player card effects." 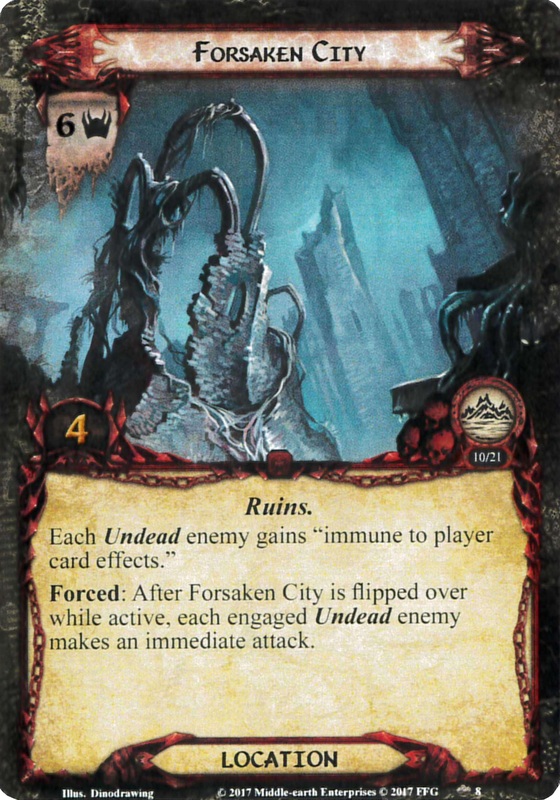 Forced: After Forsaken City is flipped over while active, each engaged Undead enemy makes an immediate attack. Surge. Grapple (most enemies grappled). Forced: After Slitering Arm engages a player, it makes an immediate attack against that player. When Revealed: Each engaged Troll enemy makes an immediate attack. If the players are at stage 1, immediately advance to stage 2A. Shadow: If attacking enemy is a Troll, return it to the staging area after this attack. When Revealed: Each Dragon enemy in play makes an immediate attack against each player in turn order. Do not deal shadow cards for these attacks. For each character that is destroyed by one of these attacks, place 1 progress on each Dragon enemy in play. When Revealed: Either shuffle an out of play Ringwraith into the encounter deck, or Southern Spy makes an immediate attack against you. Shadow: Defending character gets -1 Defense (-3 Defense instead if The One Ring is exhausted). When Revealed: Either increase the pursuit value by 4, or Uglúk makes an immediate attack against you. Shadow: Attacking enemy gets +X Attack, where X is the tens digit of the pursuit value. 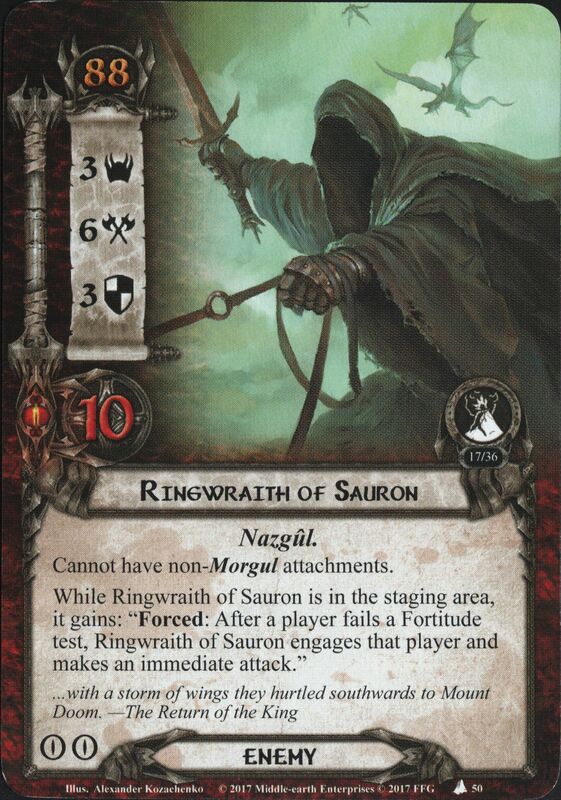 When Revealed: If Saruman is in play, he makes an immediate attack against you. Shadow: Either discard 1 random card from your hand, or attacking enemy makes an additional attack against you after this one. Forced: When Great Reed Thicket is discarded by the Mire keyword, either flip Sméagol to Gollum, or Gollum makes an immediate attack. Travel: Exhaust Sméagol to travel here.